Bokashi Bran (Pty) Ltd, established in 2012, is a business located in Johannesburg, South Africa. We manufacture Bokashi Bran® and offer sustainable, green solutions for food waste disposal. Untreated food waste rots at landfill and generates methane gas and leachates. Bokashi Bran’s vision is to make a difference in diverting food waste from landfill. Silverstar Casino, part of Tsogo Sun Group, implemented the Bokashi Bran® Food Waste Management System in February 2016. 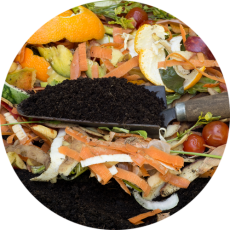 By separating food waste at source and composting, Silverstar have reduced their landfill waste from 37 tonnes per month (2015) to a mere 5 tonnes per month (2018) – a whopping 86% decrease! In addition, waste collection costs reduced by 59% over the same period. This was achieved by eliminating the compactor and reducing the number of skip lifts. Following the success of Silverstar, the following organisations also implemented the system. Artisan Training Institute, Eagle Canyon and The Blades Hotel have all been using the system for over 5 years. She has been involved with the African Youth in Organic Agricultural Production and Processing and was an expert facilitator for the African Union for the Youth and Governance Conference. Bokashi Bran is involved with developing environmentally sustainable systems for household waste that will benefit the community in the form of job creation, composting and food gardens. Bokashi Bran was awarded 2nd place in the Africa Sustainability Awards 2017 held at the JSE in Sandton. The award recognised the green solution in the waste industry. Bokashi Bran won the Mail & Guardian Green Awards 2018 for green solutions in the waste industry. In June 2016, the owner of Bokashi Bran, Bronwyn Jones, attended the Waste Expo held in Las Vegas, USA. The trip consisted of a week-long lectures on food waste management including workshopping on possible solutions. It was encouraging to note that in many respects, Bokashi Bran was already implementing working solutions for this problem. Many of the municipalities in the US and Canada have a weekly food waste collection service but face the challenge of bad odours and the attraction of vermin. Using Bokashi Bran® to treat this food waste will eliminate this problem and offer export opportunities for South Africa. 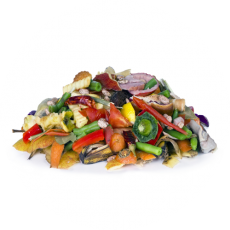 Food waste has long been a waste problem for municipalities which operate waste processing plants in the form of landfill dump sites. The separation of recyclable waste at landfill is hampered by food waste. Food waste rots when dumped, attracting vermin, disease and causing environmental damage. Bokashi Bran presents an opportunity to recycle landfill-bound food waste, save landfill space while benefit from the bokashi compost. The implementation of the system also improve quality and quantity of recyclable material. 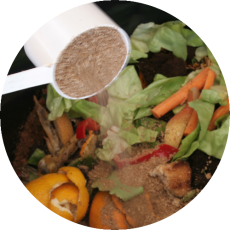 Bokashi-treated food waste contains a high nutrient value which, when composted, produces quality plant food and soil enhancer free from chemicals or harmful substances. The introduction of the macerating machines has opened the market for Bokashi Bran to engage with organisations that have high volumes of food waste. Through the maceration and de-watering system, we are able to reduce food waste volumes by up to 80% resulting in savings in compactor or skip removals. I began my journey in 2011 when I was introduced to bokashi and realised the enormous impact the product had for the environment. It seemed “too good to be true” to be able to compost cooked food and protein. I studied Marketing and Sales Management after completing my schooling on the south coast in Scottburgh. I then spent 5 years in the office automation industry before travelling around Europe and the US. On my return, I joined my family printing business where I developed my broad range of skills from design, photography, administration, production and generally running a business. In 2000, I qualified with my MBA from Cardiff University in Wales. I spent 18 months developing and testing my recipe for Bokashi Bran before having it analysed by the Agricultural Research Council. On receiving overwhelming praises for my product, I registered Bokashi Bran (Pty) Ltd in 2012. With the sobering realisation that, despite my formal academic education, I actually didn’t have a clue about running this business. I attended the Richard Branson Centre of Entrepreneurship where I began to formulate target market segments and develop strategic business plans. I was also privileged enough to attend the Sophiatown Green Incubation Ide8 programme in December 2015 where I learnt creative and innovative ways of assessing my business and through careful development and refinement of my business model canvas, I have moulded the business to what it is today. To further enhance my business development, I was selected to participate in the mentorship programme that guided me through many business development decisions and strategies. In January 2017, I was mentored by Growth Wheel Consulting under the “Activ8” programme. To further the growth and development of the business, Bokashi Bran has been part of the iLAB programme through the Entrepreneur Institute and Roger James Hamilton. This is a program of clearly defining the ROI for customers when implementing the Bokashi Bran® system. I am also now a qualified Carbon Footprint Analyst which gives me the full understanding of the detrimental effects of food waste on the environment.